The Atlantic Hurricane season has been one for the record books: 10 consecutive hurricanes in a row, the easternmost major hurricane that impacted Ireland, 50+ inch rainfall totals from Harvey, long-lasting category 5 storms, and the humanitarian crisis with Maria. However, the western Pacific typhoon season has been happening too. While no major (category 3 or higher) typhoon has formed in over a month (typhoons Noru and Talim hit in August and September), Typhoon Lan has a chance to end the streak and possibly in a worrisome way. 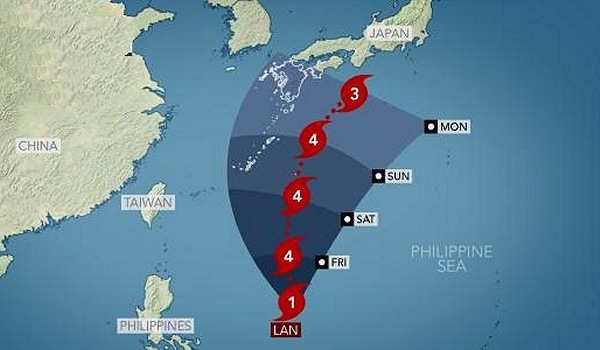 It is projected to become a super typhoon and threaten parts of Japan. Lan’s top winds could reach 138 miles per hour Saturday, which would make it the equivalent of a Category 4 hurricane on the five-step Saffir-Simpson scale, according to the Joint Typhoon Warning Center in Hawaii. As it nears the Tokyo-Yokohama area, winds will probably weaken to about 109 mph, making it a Category 2 storm. Strong winds and heavy rainfall are likely in Okinawa Prefecture and southern islands in Kagoshima Prefecture Oct. 21-22. Meteorologists predict rainfall could cause flash and areal flooding; coastal flooding is also possible. Flight cancellations are likely at Naha International Airport (OKA) and smaller regional airports as the storm moves near the islands. Authorities will likely restrict maritime operations in waters east of the Ryukyu Islands as the storm approaches. High winds and rough seas could prompt port closures. Ferries connecting the Ryukyu Islands with Kyushu and Honshu will probably be suspended. Heavy rainfall, strong winds, landslides, and significant transport and business disruptions are also possible as Lan tracks near southern parts of Kyushu, Shikoku, and Honshu Oct. 22-24. Forecasts indicate coastal areas of Shikoku and coastal Honshu may experience more than 30 cm (12 inches) of rain through Oct. 24. Flash, areal, and urban flooding are likely in the affected region. Flight cancellations and delays are possible at airports serving Kagoshima (KOJ), Kochi (KCZ), Osaka (KIX), and Shizuoka (FSZ). Significant commercial and transport disruptions are possible in the Greater Tokyo metropolitan area Oct. 23. Torrential rains and sustained winds of over 148 kph (92 mph) are possible; flooding and downed trees could block roads. Storm surge is probable and may cause coastal flooding, during high tides. Flights may be delayed, rerouted, or canceled at Tokyo airports, including Narita (NRT) and Haneda (HND). Flooding and landslides could damage roads and train tracks, prompting ground transport disruptions, including to Japan’s Shinkansen (“Bullet Train”) rail service. Delays and cancellations are possible on urban transit networks. Power outages and telecommunications disruptions could occur. Travelers are urged to review business contingency plans. Charge battery-powered devices and stockpile bottled water and nonperishable food in case power is lost. Consider evacuating low-lying coastal areas as the storm approaches. Once the storm begins affecting land operations, limit unnecessary driving in affected regions until it passes. Seek updated information on road conditions before driving in mountainous areas, which are prone to mudslides. Use caution around streams, rivers, and other flood-prone areas. Plan accordingly for potential urban flooding and transportation disruptions. Confirm all flights and train reservations.